"I don't claim to be Italian, and I'm sure many Italian nonnas would cringe at a pressure-cooked chicken Alfredo, but this recipe is kept simple to ensure the integrity of the classic dish. Please note this recipe uses heavy whipping cream, and I cannot guarantee the same success with any other liquid. I recommend Savory Spice Shop® cantanzaro herbs instead of Italian herbs. This uses an elevated steam rack, which can be found on Amazon." Slice chicken breast into 3 thin filets. Sprinkle all sides with 1 teaspoon garlic salt and cantanzaro herbs. Turn on a multi-functional pressure cooker (such as Instant Pot(R)) and select Saute function. Melt 1 tablespoon butter. Add chicken breasts and sear on both sides until golden brown, about 5 minutes. Remove and set aside. Wipe out the pot. Melt remaining 1 tablespoon butter, and cook garlic until fragrant, about 1 minute. Add pasta and stir to coat in butter. Pour in cream and stir to thoroughly combine with pasta. Place an elevated steamer rack inside the Instant Pot(R). Wrap chicken breasts in parchment paper and place on top of the steamer rack. Release pressure using the natural-release method according to manufacturer's instructions for 10 minutes. Release remaining pressure carefully using the quick-release method according to manufacturer's instructions, about 5 minutes. Unlock and remove the lid. Remove rack with chicken. Stir remaining garlic salt and Parmesan cheese into sauce. Divide pasta into 3 serving bowls and top each with 1 chicken breast filet. Top with additional Parmesan and freshly ground black pepper if desired. 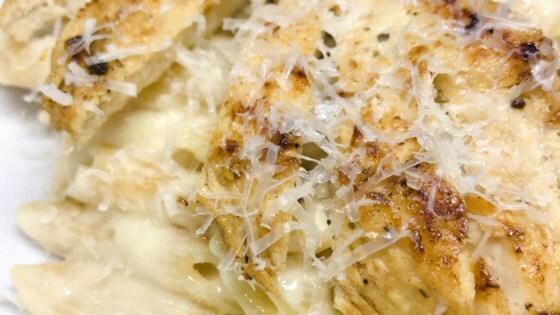 Discover the tricks to this simple, 5-star chicken Alfredo recipe. I didn't have the catanzara spice so left that out. Otherwise did as suggested except did have to add a little more whipping cream. Excellent. Even my picky husband liked it!